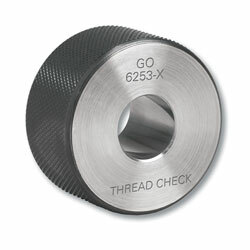 Thread Check Inc. offers a full range of plain cylindrical chrome ring gages in inch sizes designed to be used for go/no go gaging and as masters.Chrome ring gauges provide greater wear resistance. They also offer better corrision resistance. Plain cylindrical chrome ring gauges are ideal for inspecting outside diameters of manufactured parts. With go/no go gages, an inspector can quickly pass or fail parts without taking time consuming readings from a measuring instrument. Chrome plain Go ring gauges are built with a minus tolerance. No go ring gages are built with a plus tolerance. The go gage is used to verify the high limit. The no go gage is used to verify the lower limit. Fixed limit gages such as plain cylindrical gauges are made to match the maximum and minimum material condition of the part. The fixed limit gage is typically a three dimensional replica of the mating part. This system of gage tolerancing ensures that an inspector will never allow bad part to be accepted. Inspection using fixed limit go/no go plain cylindrical gages requires only basic training. The inspector only has to verify whether the gage is fitting over the outside diameter of their part. Roundness and taper does not exceed 50% of the gagemakers tolerance. 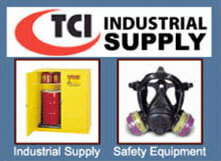 Thread Check can supply gauges from .015" up to 28.00"
gauges larger than 1.510", the gages have a flanged diameter. The gage has less material on the outside of the diameter thus making it easier to handle and use by the inspector. 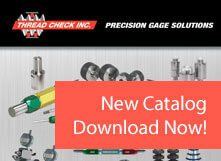 gauges are ideal for gaging the outside diameter of parts. The go ring gage is used to verify the high limit of the part and the no go plain ring gauge is used to verify the low limit of the part. making it easier to handle and use by the inspector.